Your holiday dorm room decor starts with your dorm Christmas tree. However, the dorm room decorations you place on the branches are just as important. In fact, they may even be more important than your dorm Christmas tree itself! Your dorm Christmas tree won't make much impact for your dorm room decor if you set it up in a corner of your college dorm room bare. However, once you place dorm room decorations on the branches - that's when your dorm Christmas tree really starts to stand out. When you're placing dorm necessities on your dorm Christmas tree to add to your dorm room decor, you're going to want to make sure you have mini dorm lights, ornaments, and of course garland. Garland is not something that should be forgotten or underestimated in your dorm room decorations. 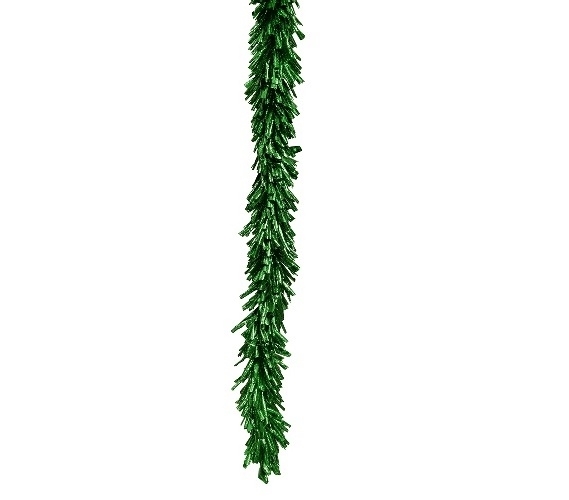 Our Green Foil Garland features a classic deep green color and has shiny foil highlights to make it really stand out. The classic color of this dorm necessities item will make it blend together nicely with your other dorm room decor dorm items and pull all those dorm items together for a complete and cozy look.